NFL MVP: The Nominees: Peyton Manning, Adrian Peterson, Tom Brady, Aaron Rodgers, and J.J. Watt. Of the nominees, two men stand above the rest. Peyton Manning has led the Denver Broncos to home-field advantage in this years playoffs by going on an 11 game winning streak to finish the season tied with the Atlanta Falcons for the leagues best record at 13-3 overall. 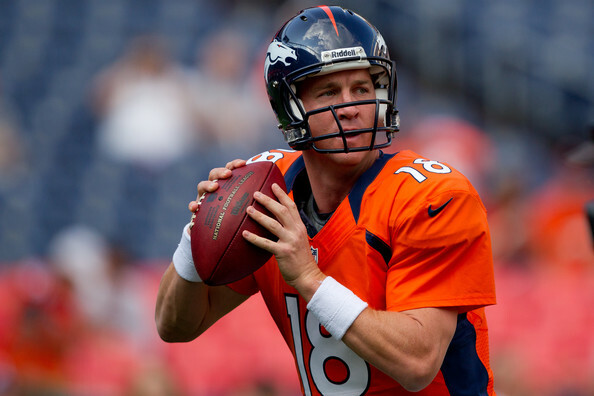 Manning has also done all of this coming back from a neck injury that kept him out all of last season. Adrian “All Day” Peterson. Peterson much like Manning, had a simply phenomenal comeback season this year. Last year Peterson was out due to a knee injury. Some wondered how Peterson would respond this season. Needless to say, Peterson answered all the questions and then some. Peterson put on a rushing clinic this season eclipsing the 2,000 yard mark, a feat only 6 other NFL running backs have done in the history of the league. Peterson finished the season with 2,097 yards, just 9 yards shy of breaking Eric Dickerson’ record of 2,105 set back in 1984. All Day’s performance this year has helped put the Vikings in the post season. My Pick: I have to go with Adrian Peterson. The fact that this man came back from reconstructive knee surgery, and nearly broke a 28-year-old NFL rushing record is enough for me. The selling point on Peterson to win this award though, rests in the fact that he helped lead the Minnesota Vikings to the playoffs. A feat few thought to be possible when the season began so many weeks ago. Peyton has no doubt had a great year, and is vital to the Broncos success, but Denver could have made the post-season with someone else at quarterback, especially with the awful play by the rest of the AFC West this year. The Vikings don’t do much of anything without Adrian Peterson this year (or any year for that matter). MVP is the Most Valuable Player award, and in my opinion there’s no one whose been more valuable to a team than Adrian Peterson this year. Comeback Player: This year the award for Comeback Player Of the Year is probably the most clear cut award as only two players fit the bill. The two men mentioned in the paragraph above, Manning and Peterson, have both done more than what anybody expected from them. Both have had great seasons. Both have their teams in the playoffs. Both came back from career jarring injuries. However, only one of them can win the award. My Pick: I’m choosing Peyton Manning for this one. Peterson could very well win this award, but I’m giving it to Manning because he not only had to comeback from an injury, but he had to comeback with a brand new team, brand new offensive sets, brand new targets to throw to, brand new everything. Manning not only came-back as the Manning we all know, but he made us nearly forget he ever left. With that, Manning is my choice for Comeback Player Of the Year, hands down. Of fensive Player Of The Year: The Nominees: Peyton Manning, Tom Brady, Aaron Rodgers, Calvin Johnson, Adrian Peterson. Like the first two awards this is another one that either Manning or Peterson could win, but given they both may win one of the two aforementioned awards Brady, Rodgers, and Johnson have a higher chance at this award. Brady and Rodgers have both had solid seasons. Brady threw for 4,827 yards with 34 TDS while Rodgers threw for 4,295 yards and 39 TDS. Both are essential to their offenses overall success. However, I’d like to argue my pick for Offensive Player Of the Year, Calvin Johnson. My Pick: Johnson has been nothing short of amazing this season. Johnson not only had the most receiving yards of any wide receiver this year, he broke Jerry Rice’ single season record for receiving yards with a 225 yard 11 catch performance against the falcons in week 16 against Atlanta. “Megatron” finished the season with 1,964 yards. Johnson averaged 115 yards and 7 catches per game this season. Those numbers are certainly award worthy. Of course, it will be hard for Johnson to beat out the likes of Brady and Rodgers, but he should absolutely be considered and is my pick for this year’s Offensive Player Of the Year. Defensive Player Of the Year: The Nominees: J.J. Watt, Von Miller, Aldon Smith. 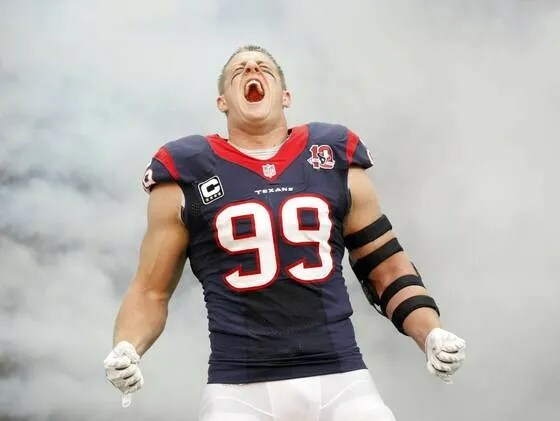 J.J. Watt- NFL season sack leader with 20.5 sacks, 81 combined tackles, and 4 forced fumbles. Aldon Smith- Finished second in total sacks with 19.5, 66 combined tackles, 3 forced fumbles and 1 interception. Von Miller- Finished 3rd in sacks with 18.5, 68 tackles, 6 forced fumbles, and 1 interception. My Pick: Again, all of these men wreak havoc on opposing offenses week in and week out, but I have to choose one. My choice has to be J.J. Watt. Watt burst on to scene last year in his rookie season with his tenacious play in the regular season, and really broke out in the Texans playoff win against the Bengals with an interception return for a TD. Watt has , asserted himself as a force to be reckoned with this year in the NFL and has earned the right to this award. Rookie Of The Year: The Nominees: Andrew Luck, Robert Griffin III, Russell Wilson. Luck: rookie record for passing yards with 4, 374 and 23 TD with a 76.5 QB rating. RGIII: 3,200 yards passing with 20 TD and 102.4 QB rating, Griffin also rushed for 815 yds and 7 TDS ranking him in the top 20 in rushing yds in the NFL. Wilson: tied Peyton Manning’ rookie record for passing TDS with 26 and threw for 3,118 yards. Wilson also had 489 rushing yds with 4 TDS. My Pick: My choice for Rookie Of the Year would have to be RGIII. No disrespect to Andrew Luck, but at the end of the day it’s hard for me to not pick a rookie stud who finishes in the top 5 for QB rating with the likes of Rodgers and Manning. Plus with his versatility in the pocket as a rushing threat he is hard to ignore. Final Thoughts: Almost forgot an award. Coach Of the Year. Mike Shanahan (Redskins), Leslie Frazier (Vikings), Pete Carroll (Seahawks), and Bruce Arians (fill in for Chuck Pagano and the Colts) all up for the honor. I believe for what Arians accomplished, in Pagano’ honor while he battled Leukemia, is more than deserving of the award and has undoubtedly earned it. Who do you think will take home the NFL Hardware? Leave a comment below. This entry was posted in Everything Else, Patriots and tagged 2012 NFL Awards, Aaron Rodgers, Adrian Peterson, Aldon Smith, andrew luck, Bruce Arians, calvin johnson, Chuck Pagano, Comeback Player, Defensive Player, football, J.J. Watt, Leslie Frazier, Mike Shanahan, MVP, nfl, Offensive Player, Pete Carroll, Peyton Manning, Robert Griffin III, rookie of the year, Russell Wilson, tom brady, Von Miller by tsmithbsb29. Bookmark the permalink.